Acute treatment starts as quickly as possible after the injury has been incurred. The objective of the acute treatment is primarily to prevent additional injury and reduce bleeding as much as possible. Effective acute treatment will reduce bleeding, formation of scar tissue, the number of complications, which can arise, and the rehabilitation period. I: As soon as is possible, Ice should be placed on the injured area. The cold ice makes the blood vessels contract, thereby stopping the bleeding. Cold spray has no effect in such circumstances. The ice must not come into direct contact with the skin, which should be covered with a thin layer of, for example, elastic bandage. 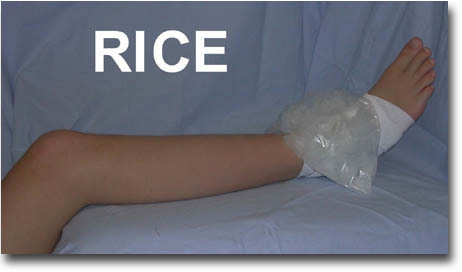 Ice treatment should be given for for example twenty minutes in each of the first three hours after injury. C: A Compression bandage should be applied, however, must not be so tight as to prevent the blood flow. The compression bandage should be removed at night, but applied again each morning until the swelling goes down. The effect of the compression can be enhanced if a piece of felt, for example, of approx. one cm. thickness is placed under the bandage and directly above the haemorrhaging. E: The injured area is kept as high as possible, and preferably above the heart (Elevation). The haemorrhaging will stop when it comes above the level of the heart. Elevation of the affected area should be performed as much as possible as long as swelling is in evidence. M: Movement – The bleeding after will stop after 24-48 hours. To remove the swelling a compression bandage should still be applied during the day and the damaged tissue can be activated by muscle tension and/or careful movements within the pain threshold. Depending on the difficulty of the injury, the rehabilitation can start up at “Level 1” (see Rehabilitation for the specific injury).